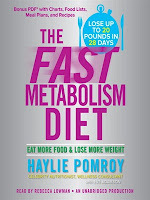 I had the opportunity to read The Fast Metabolism Diet: Eat More Food & Lose More Weight by Haylie Pomroy. I have not yet tried the diet, so I can not report my findings, but what she said made a lot of sense to me. I've been trying to 'purify' a lot of our food and go back to nature--original nature. With Genetically Modified Foods (GMF), it's not the same food as what our ancestors ate. 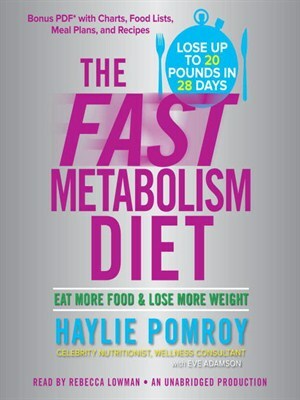 From the Publisher: Haylie Pomroy has helped thousands of clients lose up to 20 pounds in just four weeks -all through the fat-burning power of food. Haylie says "This is not a book for first-time dieters. This is a book for last-time dieters." Hailed as "the metabolism whisperer," Haylie reminds us that food is not the enemy, it's the rehab needed to rev-up your sluggish, broken-down metabolism and turn your body into a fat-burning furnace. The diet has three specific phases where you eliminate certain foods in order to help your body restart your metabolism. What I liked is the way Haylie broke down information into easy to understand tidbits. 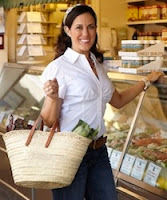 She helps you understand how to stop storing fat and how to start burning it. She breaks down dieting beliefs and 'myths' and gets into the truth of how diets work on your body and the effects to your metabolism, your fat and your body. 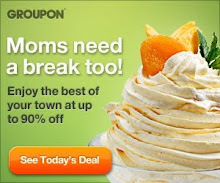 Another thing I liked was how this isn't meant to be a permanent diet. It's a 28 day (4 week) plan. The three phases take 7 days and then you repeat the phases for 4 weeks. The idea is that at the end of the 4 weeks, your metabolism will have repaired itself and you will be losing weight. There are recipes and exercises in the book and even more are found on Haylie's Facebook page. Even though I haven't yet done the diet, I have tried some of the recipes and really liked them. You can also follow Haylie on Twitter. Beyond all of that, there is a FAQ Page on Haylie's website as well as an app you can download and use. With the app, it takes you through the 28 day cycle and provides information on recipes, menus, water intake and more. I thought the app had a lot of extras to offer. I find it hard to remember all the 'little details' and don't want to carry a diet book with me everywhere I go. All of that information can be at your fingertips with the app. How would you like to try The Fast Metabolism Diet for yourself? I actually got a second copy through a sample box I won and now I have two. I'm giving away my second copy to one of you fantastic readers in the Rafflecopter form below. Disclosure: I was provided a copy of The Fast Metabolism Diet by She Speaks for the purposes of this review. All thoughts and opinions are my own. My goal is to drink a gallon of water daily. My goal is to exercise every day!! drink more water, exercise & cutback on sweets.